I picked up my 5′11″ fish in January and have surfed it almost non-stop since. It’s worked great in everything from head high points to knee high beach breaks. It makes so many sections that I never could make before and is really fast. I love it! Wanted to let you know I picked up my custom 5’7″ Zippi from Ken and Ben down at Icons, the green one. I debated on waiting for the original brown one, but decided that I could not wait 2 more weeks to get on a Zippi. I have been riding it non-stop down here in South County and S.D. It works great in small knee high slop and chest high beachies and points. Can’t wait to test in this week in some decent head high surf. My name is Ruben Tamayo. I am from Mexico. I surf in Celestino Gasca, Sinaloa, where the waves are mushy a lot of times, yet sometimes get to 10 feet. I would like to get a fish small that can handle that size wave, hollow waves, and something all around………but small. So what do you recommend for me? I am 5’9″and weigh about 150lbs. I suggest a 5’6″ or a 5’7″ Zippifish. Please let me know if there are any other questions I can answer for you. I was just researching for different kinds of fish surfboards and I ran across your website. I am 5’9″, 170 pounds and I am looking for a fish for the southbay surf as well as for a transition board from my 6′8″ thruster. I have ridden my friend’s 6′1″ Becker quad fish without any problems. What would you suggest for me? I would consider myself as intermediate plus. I have demo if you would like to try one. 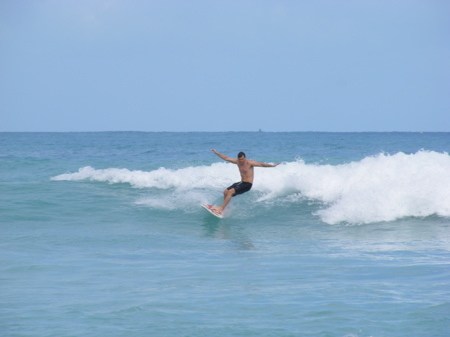 Here is a picture of Ron H. surfing in the Caribbean on his Zippfish.